As a member of a murderous mermaid clan living in Lake Superior, Calder and his sisters steal emotions and energy from humans by dragging them down deep in the depths of the lake. Most of their kills are impersonal as any lively human can be unlucky enough to become ensnared in their traps. But their latest hunt is different as they are out for revenge. Long ago Jason Hanock's family was responsible for their mother's death and the clan has been waiting a very long time for his return to the water. To lure him in, Calder turns to seducing his daughter Lily. But things go terribly wrong when he falls in love with her instead, leaving him torn between Lily and his duty to his sisters who will stop at nothing to have their revenge. Unlike some mermaid stories, you won't find any peaceful, happy creatures under the sea in Lies Beneath, which made for a very refreshing read. These mermaids can be described as nothing but vicious sirens intent on luring swimmers to their deaths. As they have no happy emotions for their own, they must absorb that energy from others in order to survive. They are rather greedy and kill much more than they need, and the females seem to be even more malicious and brutal, at least in comparison to the one merman in the story. Of course that could be because Calder wasn't born as a merman, as he was changed as a child. Then again, there is the saying: "Hell hath no fury like a woman scorned," and since the story centers around their need for revenge from a betrayal, I'm not surprised they were more blood thirsty than Calder was. I have to admit I feel rather ambient about the romance in Lies Beneath. I just didn't feel the chemistry between Calder and Lily. He was too conceited towards her and the constant stalking was quite excessive. I just couldn't figure out what was drawing Lily to him, especially as she continued to catch him stalking her. I really gave up on trying to understand her once she started to put things together. She just was a little too naive for my tastes. However, despite my feelings towards them as a couple, I do think the romance was an important part of the story as it really opened Calder's eyes to himself. It basically served as the catalyst to major changes in him as well as some shocking reveals that really changed Calder's life forever. 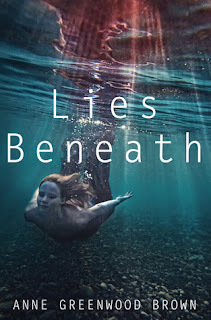 Lies Beneath was a pretty entertaining read, and despite my detachment towards the romance I'm rather eager to see what happens in the next installment, especially since it is supposed to be told from Lily's perspective. I can't wait to get a better insight into her head. Also, with the way things ended, I have a feeling thing are really going to hit the fan, especially if the mermaids find out the real truth. So, I would recommend Lies Beneath to anyone who enjoys the darker side of Paranormal YA Romance as it is definitely a solid start to this new series.